It’s been raining for 2 weeks straight. And now we have our first named storm, Tropical Storm Andrea, making her way through our state. What can you expect when you live in the Sunshine State during the first week of Hurricane Season? 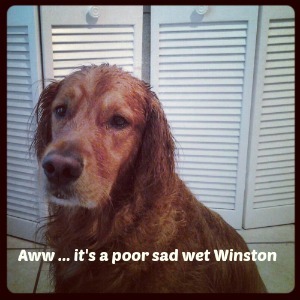 Even my dog Winston doesn’t like this weather. Every time we go for a walk, he gets caught out in the rain and he comes home looking like this. I’m sitting here at my desk, watching the rain outside my windows and the song Don’t Rain on My Parade (the Barbara Streisand version, click here to see the video) popped into my head. I downloaded it into my player and listened to it a few times. Come on folks, don’t ask me why. Sometimes, weirdness happens, just go with it. So Barbara and I are singing “Nobody no nobody is gonna rain on my parade” (and sounding quite fabulous for such a crappy wet day) and this weird message thing happened. Something inside me stopped what I was doing and told me to look up the lyrics. It’s me and not you. 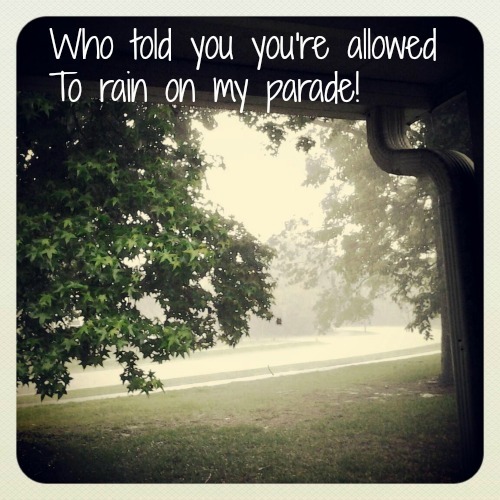 To rain on my parade! I’ve been working on my next big project. I started thinking about it a couple of months ago but it took me this week to finally flush this out and start the actual work. Like last year when I spent the summer writing my 12-week Social Media with a Strategy online class, I was starting to feel all those familiar doubting emotions. Just last weekend, I broke out into a case of the ‘What ifs’, which just messed with my head for a couple of hours. It’s amazing how my thoughts can take over and shift me off course for awhile. Most days, I just go with it. I let it control my thoughts so I can move past it. I’ve learned that when I try to ignore these thoughts, they’ll stay with me longer than if I let them have their fun messing with me. Then the next day, the sun shines and I’m back on track to where I need to be to get things done. So I’m sitting here watching the non-stop rain, dealing with the emotions from the doubt monster and add into that a little sadness … and I hear these lyrics. And I realized that if I was still married, I wouldn’t be here right now. I knew when that point hit in our marriage when he stopped believing in me and what I can accomplish. He couldn’t trust that I could do this. He was the one person in my life at that time who was suppose to be my biggest supporter and all he wanted me to do was to give up and go find a job. Even though I didn’t know back then exactly what I’d be working on, I still knew deep in my heart that there was a plan for me to do something that would help others. He couldn’t take the chance to let me do what I believed I had the potential to do. He didn’t believe in me. That was one of the triggers for me when I knew it was the beginning of the end of my marriage. Due to his own personal battle with his internal demons, he created a world of misery for himself and often, he did his best to take me down into that place of darkness with him. Dealing with him lately reminded me of how and what he still thinks of me. He has always underestimated my strength. And I do too when I let the doubts, fears and sadness take over. But I’m not that person anymore and I’m never going to back to that place again. And nobody, no nobody’s gonna rain on my parade. Go you!! Be strong, get that work done, and make a believer of everyone. Sorry you are missing Jake. Sometimes it takes moments like these to remind you of how far you’ve come. I’ve been doing my best to stay busy this weekend and not think about it that much. It’ll be easier not to think about it so much during the week when I can focus on work. I hear you. Aren’t there some things that you want to do at times but can’t because of parental responsibilities. Why not get that stuff in while Jake is gone? I did exactly that this weekend! I’m already ahead of you on that one. I had my projects spread all over the table and worked all day on Sunday. You are so efficient when it comes to work. I could learn from you. See this is when its good to have a slight case of OCD. It helps tremendously with getting stuff done for work! Is it possible to have it at select times? If so, can I borrow it. Wouldn’t it be great if we could shut things off like that? It’s good for work stuff but man, it’s hard when I’m stressing out and my OCD habits kick in. I wish I could shut those off. It might make for an interesting or funny post. I say go for it. Btw, if you follow up on this idea – I want credit and a link. I can’t speak for everyone but I am sure it could be very interesting. You go girl! I understand the missing Jake thing too..makes the heart hurt. Hope he has a good time and you get some stuff done! Enjoy your time. As hard as that sounds. And give Winston a hug for me too! Thanks! Winston is a big help but you know how these dogs can be. Between the face, the paw and that cuddle noise (that’s what we call it), he’s been here for me when I feel a bit sad. Thank you so much for all your support and prayers! I know that if anyone knows what it’s like to go through this, it’s you. And you are so right — just dealing with him lately reinforces that I did the right thing with the divorce. Mr. T’s dad has never been involved, so I never had to deal with that, and have felt very blessed in that regard, you have my heart, I’m not sure what I would do if I had to go through that! and, kudos for overcoming and having faith in yourself! Once T was older, he did start spending a week with his old baby sitter during the summer, they missed each other! I will always remember the first time I called to pick him up after the week was over – and he asked if he could stay another week! What is the saying? There are times as a mother all you want is a little bit of peace and quite – and then when you get it – you miss all the noise. I’m sure you’ve heard me say that before, but I find that it fits my life so often! PS – this morning I dropped T off at church, he’s gone for a week to camp up in OK. It’s only been hours and I already miss him! My neighbor is a single mom and she has very little contact with the dad. We talk about it all the time, which situation is better. As much as it bothers me to have my son around his dad, at least he can have his own experiences and see his dad for who he really is and not the stories his mom tells. So far my kid free week has been full of chores and work and appointments! I am a bit disappointed in myself! Lol. I intentionally setup my kid free time to do extra work and start on a project this weekend I’ve been putting off for a year. But today — I scheduled a do nothing day! It feels weird but I’m going to try to go the whole day not doing any work but fun stuff. Hope you give yourself a do nothing day too before Mr T gets home and back to the old routine.